It's what grabs the customer and sells him the product essentially so we'll help you to increase it. 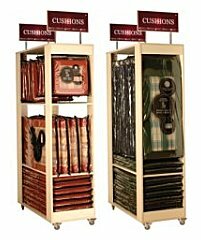 We have a range of merchandising options from large timber units that hold our replacement cushions, storing the product on the shop floor so releasing stock room space for you, to our functional dump bins, low level, easy to see and easy to use, that hold the cc range. Unit to store and display cushions. Cushion display bag with zip integrated hook. Displays 60 bottles of Teak Oil. Unit to store and display our Golden Care product range. Display card to complement our Golden Care product range. Swing ticket to attach to your display sets for our Golden Care range. Displays parasols and carry bags. If you need further information or want to discuss your point of sale options, give us a call on 01268 769641 to discuss how we can help you.